The Fastbind C500™ is heavy-duty creaser with new innovations to make large format creasing easy. A new creasing mechanism means you need even less manual force to make a perfect crease. Regardless of the stock, the handle lifts and creases easily and consistently. C500™ has several new innovations to ensure steady, accurate placement of your materials. New paper guards help optimize soft cover production. The table surface has been specially machined to ensure smooth, easy movement of the material into the correct position. With the manual Fastbind C500, you can crease up to 4 creases with one set-up. This is the optimum creasing solution for on-demand and short runs soft covers: You can do the 2 front creases (spine fold and opening crease) and pre-crease the two back creases in one operation. The fastbind C500 can crease up to 400 g/m² (225 index) card. Regardless of the stock, the handle lifts and creases easily and consistently. Depending on your needs, you can adjust the C500 to consistently give a deeper or shallower crease. 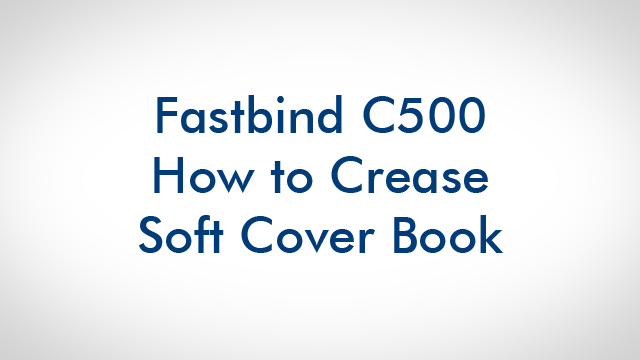 The Fastbind’s C500 is developed specially to crease book soft covers and cards for Print On Demand environment. With two alignment guides, you can make two different set-ups for the dimensions you want to use. (For example to fold letter size sheet into a three-sided pattern, or to make four creases for a book cover). Although manually operated, you can adjust the C500 to consistently give a deeper or shallower crease using the adjusters located under the creasing bar.